Episode 2 – Noam talks, I smile and nod. My favorite henna historian, Noam Sienna, is my guest on this episode of the Caught Red-Handed podcast. Enjoy via your earholes! Now that I don’t believe in Santa anymore and can buy stuff for myself my attitude about gifts has shifted. I love handmade gifts or things bought while travelling, but I especially like experiences. There are so many great sites now offering classes and tours, among other things, that are great for gifts. I’ve been shopping around these sites for myself and for other people. Then recently I was contacted by this really cool start-up called SideTour that organizes really cool experiences; they wanted me to do something related to Moroccan henna and I’m excited to tell you about it. You can see more information here: http://www.sidetour.com/experiences/experience-the-mystical-art-of-moroccan-henna-painting and also sign up for a spot. There are only 8 spots left so don’t miss out on this. If you have always wanted to have henna done this is a great way to do it: you’ll learn about henna, meet other people who share your passion for it and get henna done on you by an expert…me! By the way, I liked this site so much that I got someone on my list a gift certificate and he said it was the best gift he got all year! Le Moor c’est L’amour – Moroccan henna class in Montreal! Lumanessence Henna Body Art is proud to host MOOR Henna Master Class, with renowned henna-artist and author Lisa Butterworth — aka Kenzi — who will be coming to Montreal at the end of July to teach this exclusive class on Moroccan henna art. During the workshop, you will learn about the history and culture of Moroccan henna, as well as an in depth look at how to break down designs, construct patterns, combine elements, and more. 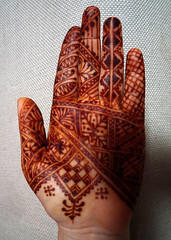 • Jamila henna cones will be made available, but if you prefer working with your own, please feel free to bring them. • In keeping with our Northern African theme, there will also be succulent Moroccan delicacies that will be served during the workshop. You will also have the opportunity to purchase the book Moor: a Henna Atlas of Morocco (which Kenzi co-authored with another accomplished henna-artist, Nic Tharpa Cartier), and have it autographed. Please let us know if you would prefer the book in hardcover or soft cover so that we can plan in the advance the exact amount of copies needed. Places are limited so to confirm your reservation, a non-refundable deposit of $30 is required before Thursday, June 28th. Below you will find a button that will lead you directly to Kenzi’s Paypal account where you can make your secure online payment. The balance amount is to be paid in cash the day of the class. The Tuaregs, a nomadic tribe in North and West Africa, dominated the caravan trade through the Sahara Desert for thousands of years. Their entire way of life was disrupted, however, by the imposition of borders, natural desertification, urbanization and the rise of maritime trade. In their quest to survive, the Tuaregs have launched several revolts in Mali and Niger, fought as mercenaries in the Libyan civil war and used their expertise to smuggle illicit goods, which brought them into contact with al Qaeda in the Islamic Maghreb (AQIM). It is the development of these skills and links to AQIM that have brought the Tuaregs to Western governments’ attention. More here: The Tuaregs: From African Nomads to Smugglers and Mercenaries | STRATFOR. At last and thanks to great demand, Nic and I will be doing another Moor Moroccan Henna Master class in NYC. The class will be on Sunday, October 16th from Noon to 5 pm in Brooklyn, NY. Henna isn’t just for redheads…or wannabes! Free class! Henna isn’t just for redheads; we can all have gorgeous, healthy and shiny hair naturally and in virtually any shade. Time to amp up your natural beauty!This FREE class will teach you everything you need to know about how to color and condition your hair naturally with henna, indigo, cassia, as well as other natural products. The class will include a detailed handout, a short lecture, a live application on a real human head of hair as well as a period for questions and answers. Products will be available for sale after the class. Did I mention that the class was free? Details will be emailed to all who RSVP to kenzilisa@gmail.com. Class size is limited so be sure to sign up early.